It's a beautiful sunny cool day in Amsterdam. 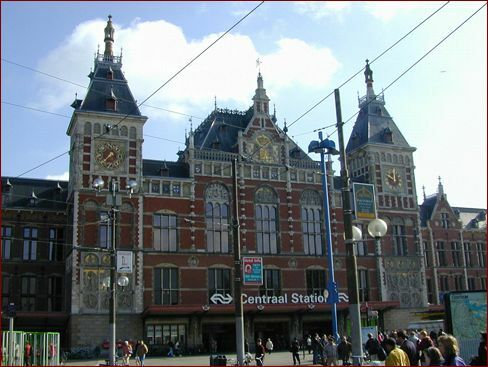 We arrive at the Centraal Station, the central station. Our bags seem really heavy. Luckily we only have to walk across a main boulevard to get to our hotel (booked via the Internet). It's a tall place, with tiny rooms. We seem to have two single beds in a room built entirely of concrete brick (and not decorated thereafter). 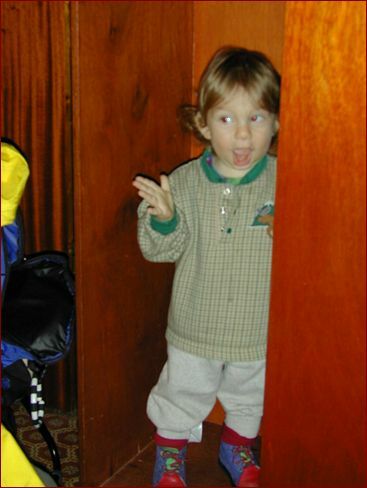 Isaac absolutely loves hiding in a closet and then jumping out (sometimes with a shout). It keeps him busy as we unpack, and during much of the following five days. His clown shoes are a favorite of mine, and sadly not made in bigger sizes. Next, we walk about Amsterdam.